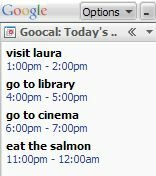 Goocal is a nice plugin for Google Desktop that shows today's events. It's easy to setup (just select Options and enter your calendar address), but it's just read-only: you can only see the events. If you want to edit an event or delete it, just click on it and the browser will open a page to edit the details. To locate your calendar's address, go to Google Calendar, click "Manage Calendars" (a small link at the bottom left of the page), select your calendar, and right-click the orange XML button next to the "Private address" and copy link location. The link will look like this: http://www.google.com/calendar/feeds/ yourusername@gmail.com/private-somecharacters/full.